Trying to remove tangles, knots, and mats from your long-haired dog can be quite a task! If you’ve ever tried it yourself, you know how time consuming and back breaking it can be. So, first, I must point out the best thing is to avoid getting these mats in the fur in the first place. Some breeds of dogs may need to be brushed on a daily basis while others may be okay for a day or two in between brushing their fur. It depends on the breed and the length of their fur. 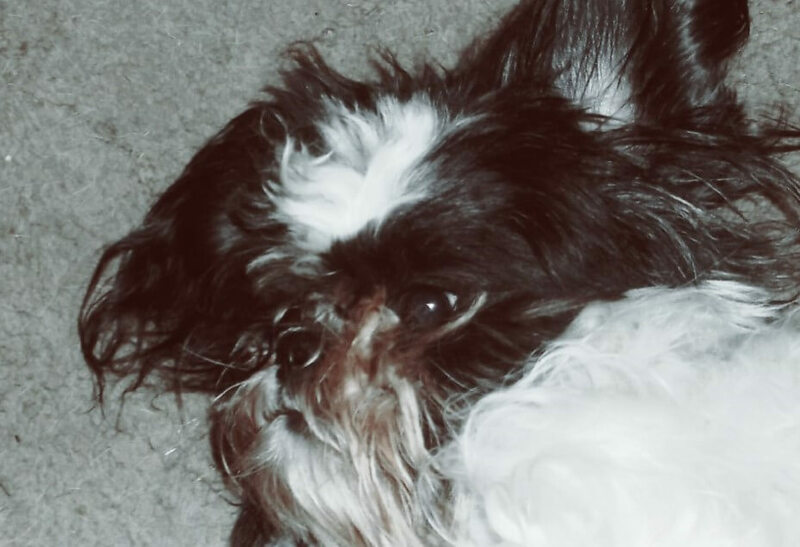 If your dog’s hair mats up all the time though, like our Shih tzu, Daisy, you’d want to brush it daily. Well, want is probably the wrong word…more like Need to brush it daily, lol! Especially, if you want to keep it long and flowing. Otherwise, without daily brushing, her hair surely wouldn’t be long and flowing, it’d be long, matted, and clumpy! You can also keep it cut or trimmed to a shorter length, which is what we normally do with Daisy. It’s just easier and although it still needs a daily brushing, it doesn’t take as long as it would if it were the full length. At full length, it just gets wet and messy when she goes outside, which makes it tangle and mat up almost immediately. I’d just rather not have to spend the time brushing it out every time she goes out and comes in…somehow her fur is soaking wet even if it’s only dew in the grass, lol. One thing that will make it much easier is to use a detangler spray first and thoroughly dampen the dog’s fur with it. It actually does help to loosen up the mats a bit easier. Plus, brushing your dog’s fur when it’s completely dry is not a great idea, I’ve found out. It actually causes static and tangles it even more. So, if your dog’s hair isn’t matted, at least try spraying it with a little water using a spray bottle if nothing else. But, if it’s already matted, use a detangling spray or cream that you work into the dog’s fur instead. Of course, after all this is done and the mats are out, you’ll more than likely need to give your dog a bath…probably yourself too! Since there will be hair going everywhere. Before I get too far here, I’d also like to mention, if your dog is getting wiggly and seems uncomfortable after awhile, then stop! Take a break from it and go back again when your dog has a chance to settle down. My small dogs have sometimes taken me a couple days even to completely finish getting all the mats out. Take your time and don’t rush your dog. Let it get comfortable with it first. Don’t overdo it and make it a miserable experience for your dog. Now that I’ve said my piece, let’s get started, shall we? If your dog is anything like mine, it’ll most likely know you’re up to something…somehow they always know, no matter how sneaky you try to be. So, once your dog comes up to you give it a little reward just to let it know it’s being good. Now that you caught your dog, start by applying detangler spray and rub into the coat so it penetrates into any mats you find. Gently try to pull these mats apart, loosening it with your fingers first. Loosen all the mats up as much as possible like this and next use the Slicker Brush to remove more of the dead loose hair. Once you go over your dog’s coat with the slicker, go on to using either a widely-spaced, large-toothed comb or a Metal Comb. Hold each section of its hair as close to their skin as you can to prevent it from being pulled as the comb goes through. Be careful not to just yank it through their hair as it’ll hurt if it gets caught up in a tangle or mat. The Metal Comb’s usually have a wide-spaced section of teeth on one end and finer-spaced teeth on the other. Use the side that looks larger and wider spaced for this. I’ve mostly seen people using metal combs like this, but I find Large-toothed Combs to work pretty well for my dogs too, which is why I’m mentioning it here. Next, use the Dematting Tool or Mat Splitter to remove the matted fur. These actually cut through the hair, not just comb through it. So, please be careful with these, since these aren’t just funny looking combs with big metal teeth. Dematting Tool I have -notice the thumb guard, lol! How can I miss that? and now I know not to forget where my thumb is placed, lol. Anyways, take your time and be careful to have the sharp side of the dematting tool pointed away from your dog (and you too) as you work through a mat. Take it one mat at a time and hold the fur close to the skin, so you can prevent it from pulling it’s hair as you go through it with the dematter. If it gets stuck, don’t keep yanking at it. Pull the dematting tool out of the mat and try in a different spot…you don’t want to tug and pull at their hair, it’ll hurt your dog if you keep trying to force it through. You wouldn’t like it if someone was pulling your hair, would you? 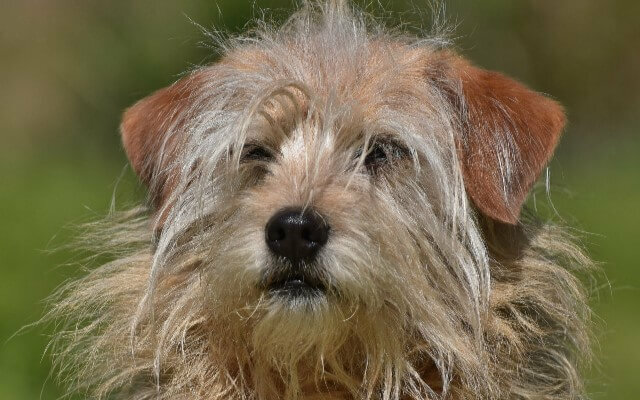 If your dog’s hair is matted so badly that it’s hard to get this through or even loosen them up with your fingers in the first place, I’d suggest to just use the electric clippers and shave your dog’s fur short. It’s not worth the discomfort your dog would go through and you don’t want your dog to associate any type of brushing or grooming with discomfort or pain. It’ll never want to be brushed again! Once you’ve gotten the majority of these mats apart with the dematting tool, switch to a Pin Brush and brush their fur out a bit. Apply more detangler if needed as well. You might still find smaller mats as you use the Pin Brush, if so, I find using another type of comb I find useful to remove some of the smaller mats is a metal comb with rotating pins or the other smaller end of the metal comb. 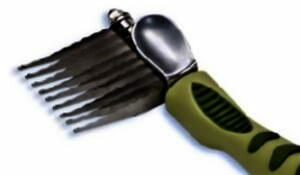 After going through with this Metal Comb with rotating pins, use the Pin Brush again to see how well it goes through your dog’s fur. If it’s going through pretty well, I’d next use the slicker brush again, just to smooth it out a bit more and to get any tiny tangles still there. 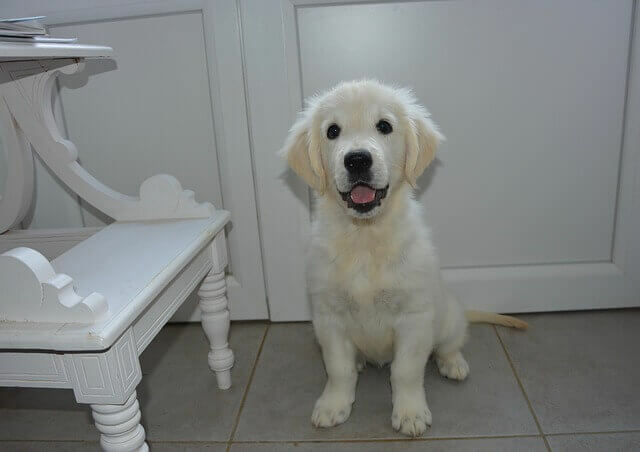 Next, it’s time for that Bath! 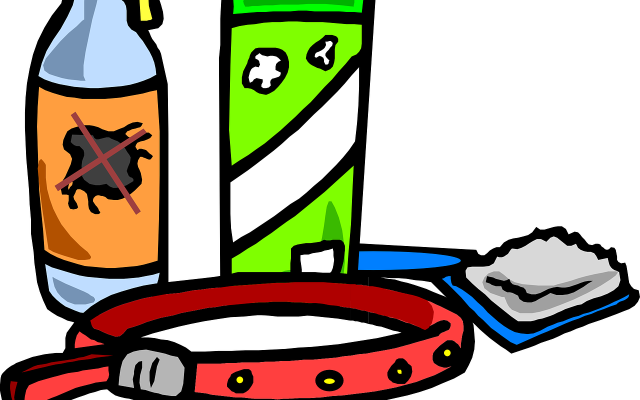 That’s it for now, and I hope this helps you out with getting rid of any tangles, knots, and mats from your dog’s hair. I know it’s no fun at all having a knotty dog! Do you have any suggestions on matted dog hair removal? Questions you’d like to ask, or products you use to remove mats that you find awesome? If so, I’d love to hear them in the comments below! If you liked this, please share it. I’d appreciate it and our little doggies do too! ← What is the Best Vacuum for Pet Hair? 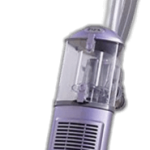 Do Shark Navigator Vacuums Stand a Fighting Chance Against Dog Hair? This is hands down the hardest part of looking after my dog- unknotting her hair. Thanks for your step by step guide to do it. We haven’t really had any method until now which doesn’t make it any easier. I have a detangler spray that I use on my daughter’s hair. Do you think it would work on my dog’s hair? Yes, I certainly agree, unknotting their hair is probably the hardest part! 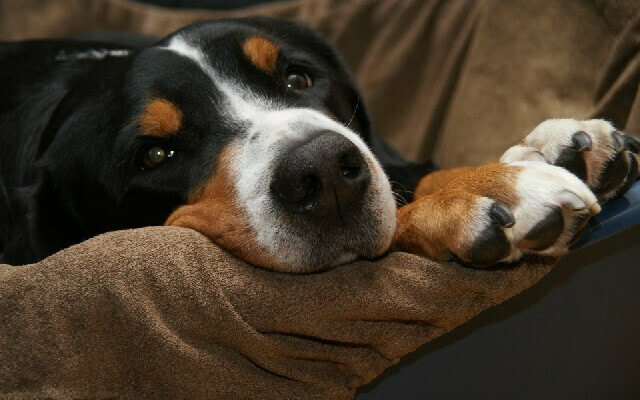 I’m glad to hear that these tips I’ve shared here will help you with your dog’s fur. Well, it might help some to use your daughter’s detangler spray with getting the mats and tangles out of your dog’s hair. But, I suppose it depends how well it works or not on untangling any type of hair. It might help in the time being, but it may also depend on what’s in it or not too…honestly, I’m not quite sure since there are many brands out there and I’m not sure which one you use with your daughter. One that I really love though, which is for dogs, and I’d definitely recommend trying is called The Stuff...it actually seems to keep our dog’s hair cleaner and less easily tangled. You can read about it here in my review post about The Stuff Detangler Spray Review. It may seem a bit pricey, but one bottle has lasted us for a long time even though we’ve used it quite frequently on our dogs. Thanks for stopping by and commenting, Hollie! I hope this helps you out with your dog, and I’d love to hear from you again sometime. If you have any questions, let me know and I’ll be happy to answer best I can. I can remember when I was younger that my mom’s dog’s hair used to get matted all the time. She would spend hours trying to get it unmatted until she finally just got her shaved. I think this is the reason I got a chihuahua. I didn’t want to go through what she went through. Good article. Lol, sometimes I wonder why we didn’t get a chihuahua! Maybe the next time we think about getting a dog, it’ll be one with short hair instead. Shaving them is also a great idea to avoid the issues of mats, I sure don’t blame your mom for doing so! I definitely agree, it sure is a lot of work having a dog with long hair. But, still gotta love ’em! These are some amazing suggestions for detangling your dog’s hair. I have a G. Shepherd/Aussie mix and she has some pretty long hair. Due to her being a mix breed she has various hair textures, a few areas tangle, while the rest stays sleek and straight. Her main problem areas are her hair behind her ears and foot hair. Her feet hair grows about 5-6 inches long, its hilarious looking. I usually just cut that off but I really like the sound of that detangling spray. I can see that helping me brush those long ear hairs of hers. I completely agree with either brush your dogs hair regularly or cut it. I have seen so many people who have let their dogs hair go and they get severe hot spots. That’s no fun! Again, I appreciate all of these helpful tips, have a good day. Thank you for stopping by and sharing about your dog here! Wow, I bet she’s a very unique and beautiful looking dog! Cutting that really long hair around her feet seems like a great idea to me…otherwise, I’m sure she’d be dragging in all kinds of dirt and grass with it. Not to mention it’d be hard to keep it untangled. Yes, the detangling spray is an awesome help for our long-haired dog…I don’t know what I’d do without it actually! She’d be shaved near bald if it wouldn’t be for that spray I think, lol. Her hair grows so fast! We’ve been using one I wrote a review about, called The Stuff for ours and it works quite well, plus, it smells nice too. I’m thinking it would help quite a bit for your dog’s longer hair around her ear areas…just be careful to avoid getting it in her eyes or spraying it right in her ears, maybe try holding a washcloth over her eyes/ear canal while spraying it will work, or spray it in your hand first to rub into the hairs. Thanks again for sharing with us! Having a dog with different lengths of fur can be quite an issue for other dog owners/parents as well! If you ever have any questions, please do let me know here, I’d love to hear how the spray works for you and your dog’s hair!